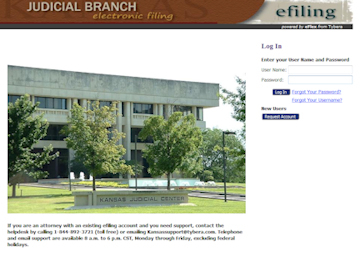 Shawnee County District Court participates in the Kansas Judicial Branch eFlex system. Additional information to register and training videos are available. Attorneys licensed and in good standing in Kansas may use the Kansas eFlex system. Pro Se filers are not included at this time. For additional information, contact the Office of Judicial Administration. Always refer to the Kansas Supreme Court and Shawnee County District Court Rules when filing any pleading. Effective June 1, 2018 all licensed attorneys must electronically file all new cases and documents within new or existing cases. See DCR 3.119 Electronic Filing and Administrative Order 2018-101 for additional details. 1. Accurate Case Information: Below are the data entry rules. Parties should be entered to match the case caption on the pleadings. Party Type: Select whether the party is a person or company. If no middle name is known, leave blank. 2. Accurate Document Type: Each document filed in the submission must have the correct document type. Clerks are instructed by the Kansas Judicial Branch to reject submissions if a document type is incorrect. Please refer to information regarding Document Types when unsure. All documents must include the case caption and case number on the first page. Multiple page pleadings must have each page numbered, and can begin numbering the page after page one if so desired. The first page of a document must allow spaces for the electronic file stamp. The electronic file stamp is placed at approximately 1 1/4 inches from the top of the page and 5 inches from the right of the page. Do not encrypt a document, the submission will be rejected. The Document must be submitted in a Word format. Replace any blank date lines with "Now on this date". Replace the blank signature line with "This Order is effective as of the date and time shown on the electronic file stamp.". Exhibits should be included with their applicable pleading. However, when exhibits are too large for a single submission, filers are to break each submission into size manageable documents with cover pages on each document and then upload each document within the submission size limitation. Each cover page is to include the case caption and case number. Currently, individual documents are limited to 10MB size limit, and each submission is limited to a 30MB size limit. For example, you can upload three (3) 10MB documents in one submission. Each page of a pleading or marked exhibit must be page numbered unless it is the first page of the pleading or marked exhibit. It is not required for page numbers to be sequential from the first page of the first document to the last page of the last document. so long as the page number is sensiblee. For example each pleading may begin with page one and each marked exhibit may begin with page one. Shawnee County District Court is in the process of consulting with developers to re-create the electronic batch filing solution that it has in place since 1997 and has been incredibly efficient in processing cases. Documentation to participate in the (new) batch filing can be found below.